Rinse fish with water. Let sit at room temperature for 15 minutes. Cover in olive oil, lemon juice, coarse sea salt, cracked black pepper & dill weed. 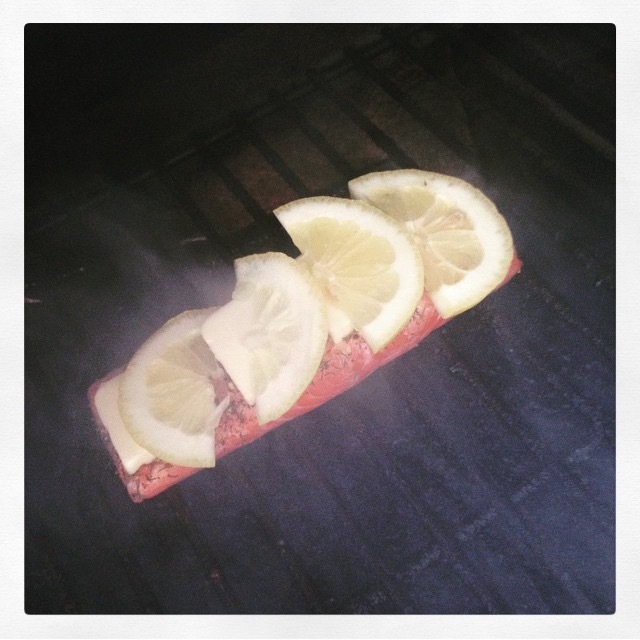 Place slices of butter and lemons on top before grilling. Grill at 500 degrees until fish reaches 140 degrees. This one was only about 1/2 inch thick so I grilled for 6 minutes. We recommend to buy salmon with the skin on. Grill skin down and we do not flip the fish. Take skin off before serving. We found the sauce recipe from Cooking Classy. For full recipe click here. Mix all dill sauce ingredients together & Served with rice pilaf and steamed broccoli. Enjoy!